The Wood River Valley before it was Sun Valley! Nellie Burns, photographer, leaves Chicago in the early 1920s to find adventure and a career in the West. She lands in Ketchum, Idaho, armed with her large format camera. After photographing moonshadows on snow, she stumbles onto a not quite deserted house and a black dog she names Moonshine. She also discovers and photographs a dead body. When the body disappears and her negatives are stolen, she joins the chase to solve the mystery and find her negatives. Rosy, a one-eyed miner, reluctantly guides her in the search. Moonshine joins in as Nellie’s guardian. A Basque sheriff crosses words and actions with Nellie. A sheep rancher with a particular dislike of Rosy and the sheriff charges Nellie with interference. The last Chinese residents in town suspect Nellie herself of murder. Nellie’s impulsive nature brings her to a second body, a near drowning, an explosion in a darkroom, and terror in a mine. 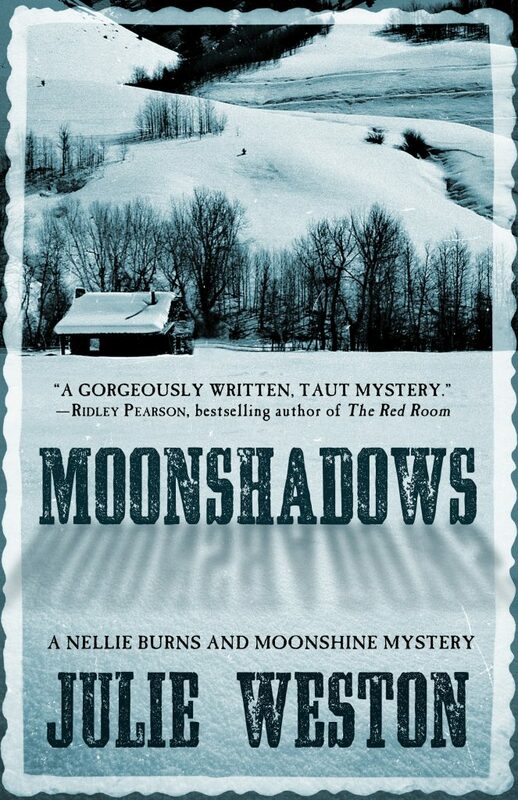 Moonshadows is a taut and enigmatic historical mystery with passionate characters, each hiding a secret. Set against wintry small towns and back country Idaho, Nellie’s and Moonshine’s explorations reveal a web of revenge, opium addiction, obsessive love and loss, and a haunting story of devotion. Idaho Author Award for Best Cover! Kirkus Review: "A photographer's aspirations take her West in the 1920s, right into a mysterious murder case. This debut mystery from Weston authentically portrays the gritty mining towns and the wild beauty of Idaho while presenting a challenging puzzle."